This cable-driven regulator available in a Black finish and Walnut details, combines the elegance of classic timepieces with the craftsmanship of a modern day case and movement. Featuring the Hermle cable-driven movement W0058 with its delicate pulleys and weights, with a white facedial with a moving moon phase indicator. 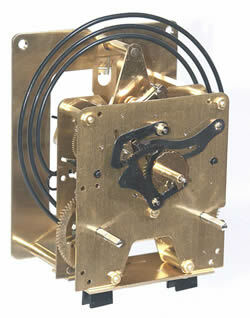 Movement 8-day cable-driven, coil gong, Graham anchor, automatic beat adjustment. The dials Bezel, the Weights and the Pendulum are in polished brass. Click here to view the Hermle 70968-030058 Mornington Black Options and Prices page.